Engraved signs provide a classy and sophisticated look to your business. As their name informs, engraved signs are those that have letters engraved or etched into their backings. They can be used for just about any purpose you wish – always offering a sleek representation of your brand. 1. They provide a wide variety of options for all business types. As mentioned, there’s no one business type that can benefit from using engraved signage. They have been utilized by large corporations at their factories and warehouses and also by smaller companies such as coffer shops and record stores. As well, there’s no one purpose for an engraved sign. Many business owners choose to use engraved signs as storefront signs, warning labels or even name tags. 2. They offer cost-effective solutions. At Stellar Signs & Graphics, we have tons of experience manufacturing a wide variety of signs. We also have a lot of experience working with business owners and other individuals who are on tight budgets. 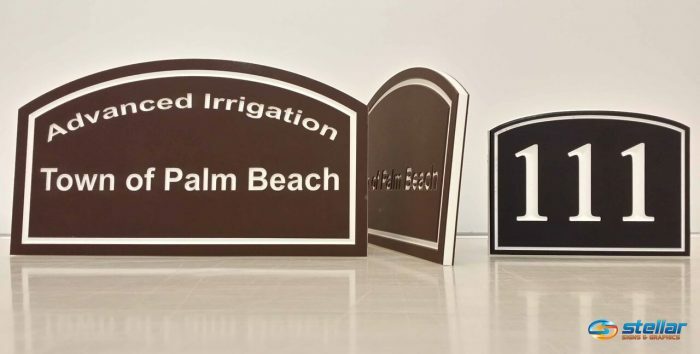 Engraved signs make great options because there are fewer materials necessary to make them. As well, engraving causes less wear and tear on sign making tools, allowing our equipment to last longer. This all translates into savings for our customers. 3. They deliver clear and easy-to-read results. What good is a sign if its message isn’t clearly visible? Engraved signs are known for their crisp and clean appearances. The sleek professional image of an engraved sign gives the businessthat uses it easy access to customers. Because the engraved letters are so distinct from their backgrounds, various fonts can be used to communicate a brand’s message. If you’re looking for “easy to read”, an engraved sign is a great choice. 4. They are durable, long-lasting signage solutions. All signs can get damaged. Factors such as rain, wind, sun and even vandalism can cause major disrepair. An engraved sign, however, is one that cannot have its letters fall off of it. Its paint won’t wash off, get chipped or fade away and its materials won’t rust. As well, engraved signs are designed to remain undamaged after a cleaning where chemicals are used. 5. They can be delivered to you quickly! The turnaround time for engraved signs is incredibly fast. Today’s technology allows us to complete our engraved sign projects in short time spans. Our team ensures top-notch quality while always meeting its deadlines. If you’re in need of a fairly immediate sign solution, an engraved sign is a great choice. Let’s start working on an engraved sign for your business today! The experts at Stellar Signs & Graphics serve the business communities in and around Palm Beach County, West Palm Beach, Royal Palm Beach, Wellington, Lake Worth, Boynton Beach, and Greenacres, Florida. Give us a call at 561-721-6060 today!